Articles » Ancient Enmity: The Door Is Closed. Ancient Enmity: The Door Is Closed. You Cannot Go That Way. I have not yet played this game, so I cannot say what those last three even mean, but I am certainly intrigued. And rather than finding this to be an area ripe for mockery, I say, it’s about damn time. What this review fails to note is that The Door is the natural ancient enemy of The Gamer. There is no object, no creature, no event that has so confounded and frustrated since the Dawn of Gaming. Bullets and monsters – indeed, Death Itself, is not as frustrating as the Door That Will Not Be Opened. Death, for instance, is easily fixed with a restore1. But The Door That Will Not Be Opened? TDTWNBO cannot be restored around, reasoned with, or broken. It cannot be robbed, killed, or tricked. 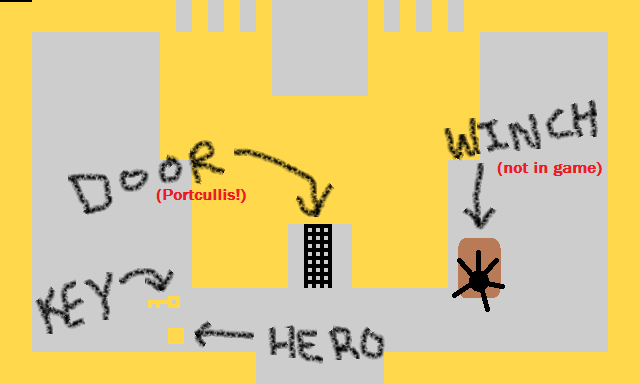 There is only One Way to open TDTWNBO, and until you find it, you’re stuck. My first gaming experience with TDTWNBO was a very long time ago, in what might as well have been a galaxy far, far away: it was a little game called ‘Adventure’ for the Atari 2600. The goal of the game was simple enough: retrieve the Chalice and take it to the Golden Castle. 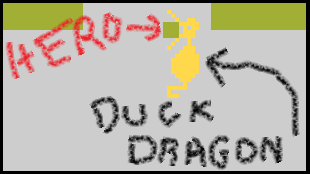 Along the way, our plucky adventurer (a perfectly square block, because graphics were awesome back then) had to find a sword and then deal with such things as mazes, angry duck-shaped dragons, thieving bats, and a bridge that was somehow portable. And doors. Every castle had a door. Every door had a key. They were color-coded. The gold key would open the gold castle, the black key would open the black castle, etc. The keys were guarded by angry duck-shaped dragons. They were also, apparently, shiny enough that the thieving bat liked to steal them. Of course, the “door” was really more of a portcullis, so I’m not sure how a key was supposed to help as a door of that nature really should have been opened with a winch, but I was around six years old, so this inconsistency - so glaringly-obvious now - was lost on me at the time. Also, despite the key/portcullis/winch question, to this day this still remains one of the more sensible door-opening puzzles ever put into a video game. 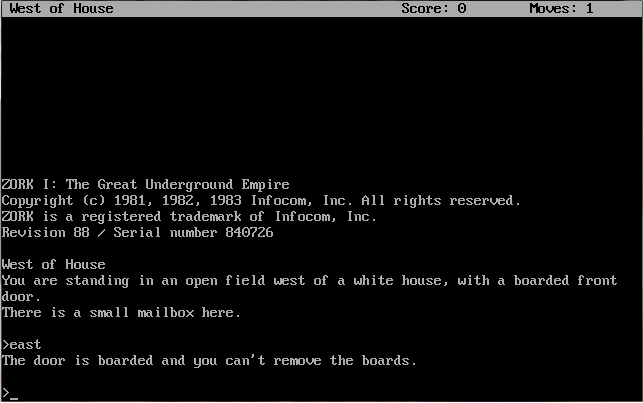 Text adventure classic Zork begins with TDTWNBO. The game opens to find the adventurer at a place called “West of House” with a boarded front door and a small mailbox. Attempt to go east, and what does the game tell you? The door is boarded, and you can’t remove the boards. All around you is a forest. That means there has to be branches and rocks that, applied vigorously to a boarded-up door, would break both the boards and the door. But you can’t remove the boards. It says so. And it means it – this is truly TDTWNBO2. 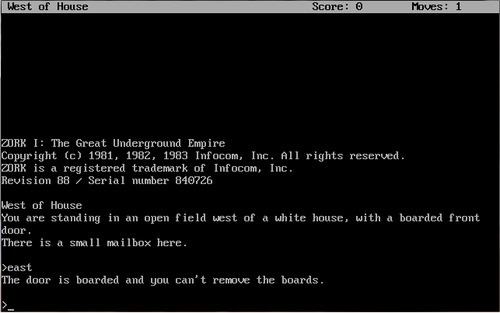 Zork II continues the trend with one of the more memorable door-openings in my gaming experience. You see, there is a locked door. Any perfectly sensible means of breaking the door are denied you. With some investigation, you will discover that the key to the door is in the keyhole on the other side of the door. To open this door, you must slide a placemat under the door, open the keyhole cover(! ), and then push a letter opener into the keyhole. The key drops onto the placemat, you slide the placemat back out from under the door, and now you’re ready to continue your adventure! More recent examples abound: one gaming friend noted to me recently that Half-Life’s Gordan Freeman can barely open a door, and he carries around a crowbar. Type just about any game name into Google and add the phrase “how do I open the door” and be prepared to be dazzled by the sheer mind-boggling intricacies video games require for what is, in the real-world, a commonplace pedestrian act. to open the friendship door in legend of Zelda spirit tracks you must look at all the statues. see how they are all facing the middle one except for two? that middle one is the man who always haves the center of attention so you go to the two statues that are facing each other. the one at the top is the woman because the center of attention man and the other man are staring at her and the other man is just the plain old other man. so you stand in between the two men and play the song of light and the door opens. After speaking with the Toad in the rec room beyond the character doors room, the rabbit quest is unlocked. You'll notice little rabbits begin to inhabit various rooms or areas both inside and outside of the castle. All the rabbits in the castle will have a colored coat of fur that matches the current character your using. So therefore you can expect a yellow rabbit variety for Wario, red ones for Mario, green for Luigi, and white for Yoshi. You will never spot a specific color variety other than the one that matches your current character. And each characters' matching colored rabbit will show up in a predetermined area which never changes. For example; one of Luigi's green rabbits show up in the Bob-omb Battlefield portrait room. So long as you are using Luigi, the rabbit will continue to show up in this specific room weather you have caught it or not. But if your another character in the same room, the rabbit will not be there. Once a character catches a rabbit, the rabbit produces a key that unlocks new mini games. Once you have that key you may continue to catch the same rabbit an infinate ammount of times but will not be further rewarded. Also, once the rabbit is caught and the player saves the game, that specific rabbit has a random chance to turn into a sparkling rabbit. The sparkling rabbits only randomly replace rabbits currently caught at least once by the player. You'll need to catch 8 sparkling rabbits to get the key for that lone room with the white door. You can catch a sparkling rabbit and return to the same room and re-catch it again later since unlike the normal rabbits, the sparkling variety will continue to add to your total until you have caught all 8. Stand back a little from the door and push the button you normally use to open doors. If you are in Golem form and your Hurl Rock skill is fully charged he will throw a rock and smash the door open. No, a comprehensive door-breaching mechanic is not something to mock in video games, but something to celebrate. At last – at long last – the question “How Do I Open The Door?” has a sensible answer: kick it down.